Current X-Ray sensing technologies utilize single or dual energy data acquisition systems. Single energy systems cannot provide any material discrimination information and dual energy systems can only provide a very basic distinction between organic materials, inorganic materials and metals. Multi energy spectrometric data acquisition systems allow for much improved material discrimination and can produce qualitative results about elemental composition of the material or materials screened. This method enables elements or combination of elements from the entire periodic table to be analyzed. Adapting an advanced technology used in security domain, MultiX is offering an integrated ME100 system for the food industry. Each material has a unique X-Ray absorption signature. Multi energy spectrometry introduces new features that can be used to increase the ability of a system to discriminate between similar materials such as those found in food stuffs. Each material has a specific X-Ray spectral signature, ME100 spectrometer allows for real time identification of each material being screened. ME100 spectral digitalization improves the equivalent material and density analysis. Material composition is mainly detected in low energy bands. For OEMS (x-ray machine manufacturer), the ME100 detector is configurable by software to be adapted for each specific customer application. 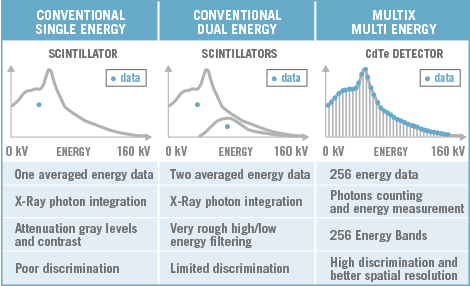 Multi energy spectrometric data allows for improved differentiation and categorization between materials that are very similar.